MARCH EXPO - Getdd Welson Chemical Ltd.
GETDD Welson Chemicals Ltd was founded in 1996, now we are wholly-owned Singaporean company. Based in Guangzhou's Economic Technical Development District (Getdd) in China, Welson is the first specialty chemicals company in the region that caters to the various needs of the food processing, hospitality, healthcare, water treatment, healthcare and processing industries. We are proud to announce that Welson Chemicals ltd. was awarded its ISO 9000:2008 certification of approved by Bureau Veritas Quality International on March 20th, 2000 (CertificateNo.272437). We also have been awarded 'QS' production permit by the National Quality Inspection Center on Dec 31st, 2009. 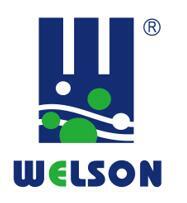 Welson is committed to high quality customer service. We understand the disparate needs of our customers, and cooperate with them to realize their goal of employing premium cleaning solutions at affordable used cost. From Welson's founding, it has strive to be a leading innovator in adapting its solutions to the needs of its customers. By listening and addressing individual cleaning, sanitizing and maintenance concerns, Welson is committed to a customer-centric approach. In Welson, we fully understand that our success is only possible when we deliver solutions that positively impact our customers bottom-line. Hence, our sales pitch is built on demonstrable and verifiable results. Welson has consistently demonstrated differentiated cost savings for its customers while delivering solutions that out-perform the competitions. Welson's competencies are built on the strength and experience of its people. Led by industry veterans who have over three decades of experience in marketing specialty chemicals in Asia an China, Welson is well-equipped to serve as a solution provider to meet the continuous challenges encounter in today's cleaning and sanitation demand. Its executives understand the dynamics of the market, and the focal areas where Welson can most make a difference to its customers' competitiveness. Initially incorporated as a cooperative in Guangzhou, China, Welson has rapidly expanded over the years to serve the major markets of HongKong, Beijing, Shenzhen, Guangzhou, Shanghai and all over of China. Welson also export to overseas market such as Canada, Thailand, Hong Kong, Australia, Russia, Singapore, Angola, South Africa, Malta, Sri lanka and so on. If you are interested, please feel free to contact me!